I first learned about Proyecto Titi's Eco-Mochillas project when I heard Rosamira Guillen at the 2007 Wildlife Conservation Expo. 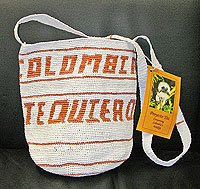 Mochillas are traditional bags made in Columbia. 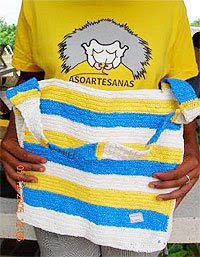 Proyecto Titi redesigned the bags to be made with plastic bags. This means no more plastic bags in the forests or on the side of the roads. The people who share their villages with the Cotton Top Tamarin can now make a living producing Eco-Mochillas (pictured below). Plastic bags have become a form of currency in these villages. The women in these villages are now able to support there families by making Eco-Mochillas. The women go door to door to collect bags and spread knowledge of why it is so important to protect the Cotton-top Tamarin. Villagers now learn to appreciate and cherish their special neighbors. 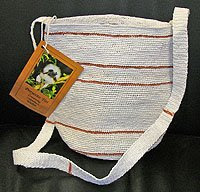 Eco-Mochilas available for purchase from Proyecto Titi. Click here to purchase your own Eco-Mochila.